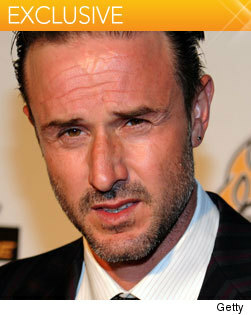 David Arquette sure has a great sense of humor about his recent split from Courteney Cox. On Friday night, at an intimate screening he hosted at Hollywood’s Roosevelt Hotel -- the venue for the upcoming David Arquette Presents Beacher’s Madhouse -- for the new Terry Gilliam-directed short film "The Legend of Hallowdega," in which Arquette stars opposite Justin Kirk, he made a couple of subtle jokes about the split. At the screening, presented by AMP Energy Juice, Arquette was introduced by his business partner Jeff Beacher on a stage in the hotel’s new subterranean space. Arquette told the small crowd, laughing coyly and looking at Beacher, “It was filmed in Alabama…um, where my wife’s from.” That elicited laughing and snickering from the audience, as well as Arquette himself and Beacher. Then, later on during his introduction, Arquette mentioned that while in Alabama, he came in contact with a town called Anniston (think Cox’s BFF Jennifer Aniston), saying, “I should have known that would be an omen.” Again, he and Beacher, along with the audience got a good laugh.